Romesco is a raw red pepper and almond sauce that originates from Spain. Gaby from What's Gaby Cooking shares her healthy version with Foodista readers. Roasted almonds are pureed with jarred roasted red peppers, paprika, vinegar and bread to make a flavorful dip for vegetables. 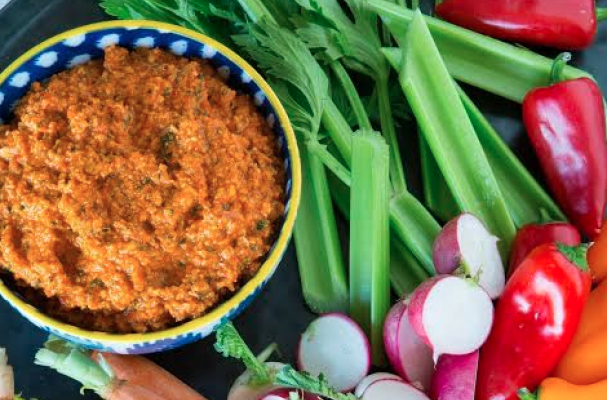 Romesco is a delicious alternative to hummus or blue cheese dip. You can also rub it on fish or chicken. In a small skillet, heat oil over medium high heat. Add the torn pieces of bread and whole natural almonds and toast for 2 – 3 minutes until the bread starts to turn golden brown. Once toasted, let the mixture cool. Transfer the entire content of the skillet to a high-powered food processor or blender. Add drained red bell peppers, vinegar, paprika, garlic and parsley and pulse for 2 minutes until smooth. Taste and season with salt and pepper as needed. Pulse to combine. Serve with assorted fresh, sliced vegetables as a dip. Any leftovers can be used as a sauce for pasta, chicken, fish or red meat.